Minister of Financial Services Ryan Pinder held discussions with the director general of the World Trade Organization, Pascal Lamy, October 24 in Brussels. 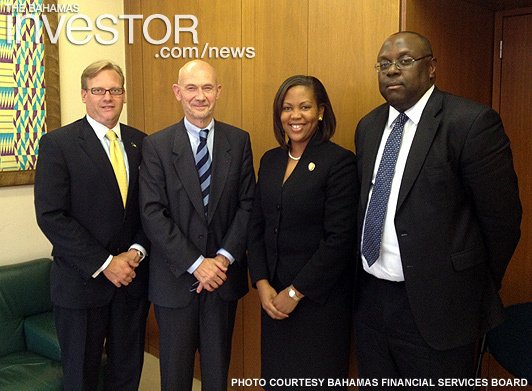 Pictured: (left-right) Minister of Financial Services Ryan Pinder; director general of the World Trade Organization Pascal Lamy; acting director of trade and industry in the Ministry of Financial Services Viana Gardiner; and Charges d’Affaires in The Bahamas High Commission in London Frank Davis in Belgium October 24, 2012. The Minister of Financial Services, who also has responsibility for international trade, Ryan Pinder, held discussions with director general of the World Trade Organization (WTO) Pascal Lamy October 24 in Brussels. The Minister discussed the way forward for The Bahamas’ accession to the WTO. The two heads also discussed the steps taken by the Bahamas government since its second accession Working Party Meeting with members of the WTO in Geneva in June of this year, and the preparation being made for the third Working Party Meeting scheduled for March 2013. The Working Party meetings are the forum in which members of the WTO collectively scrutinize an acceding country’s domestic trade regime. These meetings have provided the springboard for bilateral negotiations between The Bahamas and other member countries. Minister Pinder advised that the government had made considerable strides on its trade legislative agenda, particularly as regards legislation on intellectual property, sanitary and phyto-sanitary measures, tariffs, anti-dumping measures and direct investment transparency. He also noted the steps taken by the government to bring significantly greater public awareness and education regarding the WTO accession process, in the hosting of workshops and planned symposiums. Lamy noted that the momentum that has been created in The Bahamas’ bid to accede to the WTO. He complimented the country on the progress being made and stressed the importance of creating the necessary legislative framework to support The Bahamas’ accession to the WTO. Lamy gave advice regarding bilateral negotiations and committed to personally assisting at a high governmental level with the accession process. Minister Pinder was accompanied by the acting director of trade and industry in the Ministry of Financial Services Viana Gardiner and the Charges d’Affaires in The Bahamas High Commission in London Frank Davis. Although things are returning to normal on the major islands of The Bahamas in the wake of Hurricane Sandy, according to government officials, some cruise lines' private islands still require substantial clean-up efforts before they can re-open for business. The Bahamas Financial Services Board has announced that an independent Blue Ribbon Panel has selected a partner of the law firm of McKinney, Bancroft & Hughes, April Nicole Turner as the Financial Services Industry’s Executive of the Year.